Articles Tagged "C. De Jager"
Fig. 1. Sunspot numbers since 1610, showing the 11-years cycle. 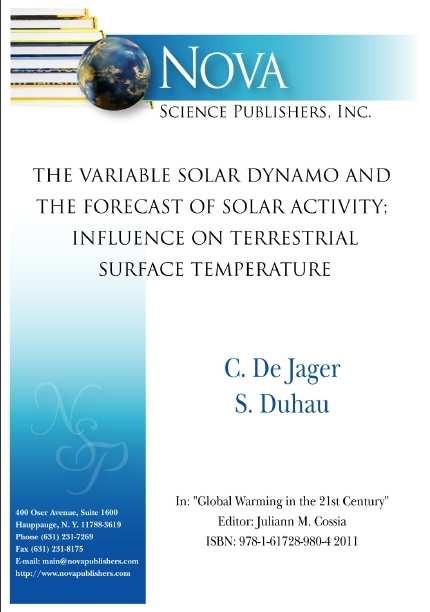 Solar activity, as manifested by its many equatorial as well as high-latitude components of short-term variability is regulated by the Sun’s dynamo. This constitutes an intricate interplay between the solar toroidal and poloidal magnetic field components. The dynamo originates in the tachocline, which is a thin layer situated about 200,000 km beneath the solar surface. The dynamo is a non-linear system with deterministic chaotic elements, hence in principle unpredictable. Yet there are regularities in the past behaviour, such as the Grand Maxima (example: the recent high maximum of the 2nd half of the 20th century) the Grand Minima (e.g. the Maunder Minimum between 1650 and 1710) and the Regular Oscillations such as those between 1730 and 1923. Their occurrences are described by a phase diagram in which a specific point can be identified: the Transition Point. This diagram plays an essential role in determining the future solar activity. Guided by its quasi-regularities and by recent measurements of the solar magnetic fields we find that the Sun is presently undergoing a transition between the past Grand Maximum and a forthcoming period of Regular Oscillations. We forecast that this latter period will start in a few years and will continue for at least one Gleissberg cycle and that the next solar maximum (expected for 2014) will be low (Rmax ~ 68).